I'm very happy to be back. I'm contributing to this blog, maintaining a calorie budget and staying fairly active with Facebook and Twitter. I'm logging food, exercise and water consumption everyday on My Fitness Pal. 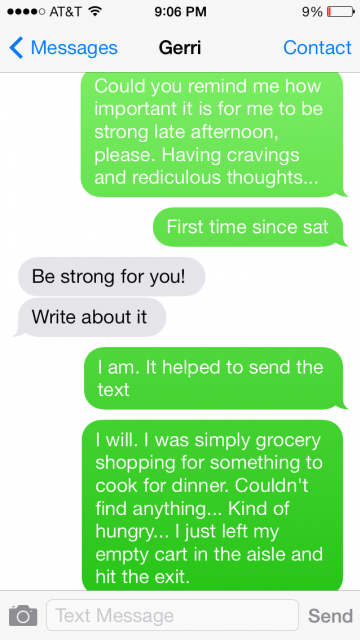 I'm also staying closely connected to friends far and near, staying accountable and reaching out via text whenever a counterproductive food thought passes through my brain. Oh yeah, Gerri Helms has taught me, the best way to shut those crazy obsessive food thoughts down is to tell on 'em to someone, anyone. I'm getting more and more in touch with my own personal spirituality throughout this process. I'm realizing the truth, and that is: This isn't a solo battle. I'm not alone. You're here. I'm here. We're all here and we're doing this thing. And this thing is worth every ounce of effort. It's about life and freedom, clarity and peace. And it's about love and taking personal care. Choosing change is about all of these things and more. It's not effortless. It's work. But it's good work. It's not always fair, but some things just aren't and that's okay. I'm wholly committed, my friend. And it feels phenomenal. It does because it wasn't that long ago when I wondered if it was even remotely possible to feel this way again. I was at the point of completely giving up. Struggling harder than I ever imagined possible, isolating in a place full of shame, guilt and regret...filling up on self-pity, self loathing and a general disgust--completely choosing a perspective void of even a shred of hope. And still occasionally trying to get it together only to fall again and again. As the weight gain continued, old issues started resurfacing. I suppose it happens over time. It's like we have a constant checks and balances happening with our perception of the good and the bad of our life. Every negatively perceived thing makes a mark, an impression, a scarring on our brain and then it sits and waits for other negative things to join in and these things grow. Most of the time these negative perceptions aren't even our fault, but in a desperate effort to explain and understand, it becomes easier to just take the blame. And maybe some aren't even bad, but compared to the standards and beliefs we hold, they're perceived that way. And so it goes, our self-esteem, self-worth. And the other side, the positive happenings? They are wonderful, and they keep us going, but eventually they're diminished by the overwhelming darker, more negative perceptions, a bad apple if you will, spoiling the bunch. This is the moment when "I'm Choosing Change" becomes even more powerful. And it does because it's uninhibited by the deep seeded belief of unworthiness. I've heard from many people in the last few weeks who have found themselves in the same situation as me: Losing a large amount of weight, maintaining for a while, then gaining back a considerable amount or in some cases, all of it and more. I wish I could fashion the words to accurately describe my gratitude for this level of sharing and support, it's simply overwhelming in the most wonderful way. Your support and sharing inspires and strengthens me. Just saying "thank you" seems grossly inadequate. Sincerely, thank you. I've tried different "perspective exercises" before and the one I'm about to share is good. Gaining back 143 pounds of a 275 pound weight loss hasn't been easy to stomach for me. At the same time, I realize how fortunate I am, breaking out of the hiding and secrecy and confronting this now instead of waiting until much later and much heavier. Stopping the breach has been difficult. Stopping, or properly handling my negative emotions surrounding this gain has certainly been an opportunity for spiritual growth to say the least. Because considering how "thoughtfully abusive" I've been to me, it's a miracle for me to break away from the nose dive of self-loathing, pity, regret, shame and guilt. There's nothing positive in that camp. A different perspective is paramount for a turnaround. "How wonderful I feel now...If I feel this good in the 370's..." Perspective, indeed. Pure positive spirit unencumbered by anything even remotely negative. This is where I am and I'm excited to be pointed and headed in a wonderful direction. If you have your own personal blog or journal, diary, notes, old facebook status updates or anything from the past that will give you the essence of this exercise, I highly recommend trying this for yourself. In reading the old blog post, I couldn't help but smile and feel incredible. Also on Day 182, I found something that caught my attention, so I'll include it too. Of course, as I read it I realize some of the most destructive "negative encouragement" has come from my own brain. It's a beautiful day in Oklahoma and I'll be getting out in it this afternoon for a much needed walk. I hope your Sunday is going well too. I've been using a borrowed cpap machine post sleep study while I wait for the results and new prescription best for me. I do not recommend this to anyone. A CPAP is specifically set for each person and using one with a high setting if you don't need a high setting could be very dangerous. The only reason I'm okay with doing this is the pressure setting on the borrowed machine is 7, which is relatively low. It's not the higher level of pressure I need, but it's something. The very dear friend who loaned me the machine has recently lost a considerable amount of weight and lucky for him, he seems to be relieved of the disorder. His machine wasn't in use and hadn't been for some time, so out of desperation I gladly accepted his offer to let me borrow. The first night wasn't good because I wasn't accustomed to this type of continuous positive pressure. After learning what little I did from the sleep technician (about the absence of central apnea episodes) there wasn't anyway I was strapping the bipap to my head again. Not wanting to go without something to encourage breathing, I'm using this machine until I get my own with the custom settings. My rest has improved each night as I adjust to a different kind of air pressure flowing through the tube. I even made it through an entire work day without needing to take an extended nap break! It isn't perfect, I'm still tired but I'm not body breaking down exhausted, and that's a very nice improvement. Taking good care takes constant effort and awareness. It also takes reaching out to people for support. It's a powerful thing, the role support plays in this journey. At some point I think I resigned myself to the belief that it was just too hard to care anymore, given the circumstances. But honestly, that's baloney, and further--it's a very counterproductive attitude and perspective to adopt. With support coming in from all sides of the social media universe and the tremendous support from close friends far and near, I've successfully made it two weeks without a binge. I've drawn on my own spirituality many times during this period and that's having a giant impact too. I'm also not giving in or sacrificing what I need and what's best for me in order to be more available or pleasing to anyone else. That last sentence is a biggie because my very nature is to be a people-pleaser, at all costs. And what happens when I sacrifice what's best for me today, right now--in this moment...is, no matter how small, the start of an unraveling of sorts. This focus or "obsession" as I've heard it called, is paramount to my success at this juncture. My health and well being is at stake and I'm getting all sorts of "obsessed" about taking care of me. When it comes to what I'm eating, I'm a little more selective than when I started losing weight over 5 years ago. I find myself naturally staying away from simple sugars and eating more fruits. I'm eating more protein most of the time, at least according to the nutrition breakdown on My Fitness Pal. I'm a creature of habit too. My breakfast is most always the same and I have other staples I rely on throughout each day and evening. I'm fairly careful with my calorie investments because when the 1700 in the bank is depleted, I'm done. There is a mountain of research information about nutrition and so much I don't know or haven't taken the time to understand. After all I've learned along this road, I'm still very much in the "lower calories-more movement" equals weight loss. And I'm there despite the fact that perhaps with a few tweaks here and there, I could fine tune and manipulate how my body burns fat; how the metabolism operates. I'm still learning and most importantly, my mind is open to learning. Although I'm very careful not to take too much in at once or else I'll get overwhelmed and that could lead to frustration and feelings of inadequacy...neither good for me at this point. My first official weigh-in will be February 11th at my doctors visit. I have a complete fasting blood lab scheduled for the 7th and the follow up appointment is the 11th. I'm fine with this lengthy time between weigh-ins. I've talked about and written extensively about the psychological power the scale seems to wield, especially when weight isn't coming off as quickly as we had hoped. It's also powerful when it does and when a big loss is recorded it sets the expectation bar really high and when results slow, it can be very disappointing. So a relaxed weighing schedule is okay for me, perhaps monthly. Yeah..once a month at my doctors office, same scale...I can do that easily. I've recently strapped on my "I'm Choosing Change" leather bracelet and I'm wearing it proudly. I hadn't sold one in so long, I think my manufacturer/supplier had given up on me. Then, out of the blue I received an order from Mona. I immediately sent Mona a message explaining I was out of stock and it might be a few weeks for me to have more of these custom made bracelets produced. She was fine with this, so I called the supplier. The minimum I can have produced at one time is 20. So I ordered the minimum. Yesterday I decided to offer up these 19 additional bracelets on facebook and the response was phenomenal. If you were one of the people ordering, thank you! Within hours the 19 were sold out. Then I received a few more orders. I will ship the first 20 orders and have an additional 20 manufactured next week. If you haven't bought yours, maybe now's the time! Once again, I'll have a surplus of 17! I'm not a very good salesman, I'll admit. I never "push" anything really. This blog isn't a platform for sales, never has been. But I would like to move these additional bracelets. If you would like to order one, simply click this link http://www.transformationroad.com/505store.html scroll to the bottom of the page and you'll see pictures of this fantastic bracelet! The $18.00 price includes shipping anywhere in the world. The international rates are a little pricey, but that's okay--I'd love you to have one regardless of where you are. The "add to cart" button takes you to a secure PayPal site for your purchase. Thank you for reading and your support. I sincerely appreciate every single well wish and prayer. I'm doing my best to read as many blogs and postings of others and offering my support as I can. I'm also loving the tight support offered in My Fitness Pal. My social media network includes Facebook, Twitter, this blog of course and My Fitness Pal. You can also reach me by email anytime. One of the major challenges I experienced after hitting goal in November 2010 was a horrible return of my sleep apnea. It was something I honestly thought was gone forever because after the first 100 pounds lost, it virtually disappeared. Suddenly I could sleep, breathe and feel fully rested without a cpap machine and I rejoiced! But then it came back somewhere around the 200 pounds lost mark. I've since discussed this with sleep lab technicians and a doctor who all confirmed this was a common occurrence. I quickly reinstated the use of my cpap when the symptoms started happening again. But this time it wasn't working like it did before. I was still exhausted everyday. A month after hitting 230 pounds, I underwent the first of two sleep studies over a two month period. The final diagnosis was sleep apnea and central apnea. Things had changed dramatically. I had never heard of central apnea. So I quickly googled it: "Central sleep apnea occurs because your brain doesn't send proper signals to the muscles that control your breathing. This condition is different from obstructive sleep apnea, in which you can't breathe normally because of upper airway obstruction. Central sleep apnea is less common than obstructive sleep apnea. Central sleep apnea may occur as a result of other conditions, such as heart failure and stroke. Sleeping at a high altitude also may cause central sleep apnea." I had both. Obstructive and this less common, brain doesn't work central version. The treatment involved a different type of machine. I started using this new machine and I was still tired. It wasn't easy to get comfortable with this bipap at all. My body would fight it most of the time and most nights the mask would end up off by morning. Sleeping without it seemed the better alternative. I stayed active during this time, continued eating within a reasonable budget and exercising. I successfully maintained the 275 pound loss for a year and a half. And I rarely made it through a full night on the bipap. I made it a habit to nap almost everyday in an effort to make up for the lost sleep. Honestly, it didn't make too much sense trying to make up for bad sleep with more bad sleep, but as it became worse, I became desperate. Eventually I forced myself to use the bipap machine and soon I was making it through the night. It wasn't ever effective, at least not to the "night and day" degree of my previous cpap experience. As my sleep became worse, I became more and more depressed, less inclined to exercise and basically lethargic. This wasn't how being at a healthy weight was supposed to feel! Instead of being proactive and speaking up, I took a negative approach--citing the expense and trouble of possibly needing another sleep lab to help fix whatever was wrong this time. Instead of figuring out a way to do what was medically necessary for me to take better care of myself, I fell into a pattern of bad sleep, nap in the middle of the day, followed by bad sleep again the next night. During this time I started regaining at a steady rate. I'm not offering this as an excuse of any sort. It was/is a circumstance and my attitude and reaction to it wasn't the best course for me. And this wasn't the only circumstance contributing, there were relationship issues and a few other things contributing to this depressive cycle. Depression breeds things to be depressed about, you know what I mean? But this post isn't about the why of where I am. This post is about me being proactive and taking better care of myself now, today. The apnea has worsened recently. At the same time I've declared to take better care by maintaining a balance with food and exercise, writing more and getting a handle once again, I've been exhausted worse than ever. Despite this, I'm thrilled to report that reclaiming this balance has brought me tremendous support and strength and I'm doing wonderfully with food. Exercise has been another story. But in the name of compassion for me, I'm okay with a lighter exercise schedule for now. I clearly must get this sleep issue treated immediately because untreated, it's making everything ten times harder, not to mention what it's doing to my metabolism. Tuesday morning I drove to work feeling unfit to drive. I somehow made it through my radio show but not without a few slurred words here and there and what might have sounded like a slight intoxication. I was sent home immediately after a 9:30am meeting and told to get some sleep. But isn't that the most frustrating thing? That's all I want to do! But I can't. I called the doctor as soon as I got home and I must have impressed an urgency on the nurse because the doctor called me directly a short time later. I expressed to him how horrible things had become and asked for an emergency sleep study or a fast track appointment, something---anything...I just need relief. Yesterday afternoon the nurse called back and had me an appointment for a sleep study that night in Stillwater. Talk about an answer to a prayer! I was asked about my previous sleep lab studies during my intake. I mentioned the sleep apnea and central apnea diagnosis. The technician stopped me and asked, "Did you have some kind of brain trauma?" No, I haven't had any kind of brain trauma that I know of in my past...and she said "Usually central starts as a result of trauma." Hmmmm. Okay. She continued hooking me up to all kinds of sensors and the sleep study started. It was purely diagnostic, meaning I slept without a machine of any kind. And when I woke, I found out something very interesting. The sleep technician monitoring me all night said she couldn't say too much, because the official reading would come from the doctor, but she wanted me to know that there wasn't any occurrence of central apnea. Not one. All night. Which leads me to believe I was possibly misdiagnosed during the sleep labs from three years ago. This would explain why I never adapted to or benefited from the medical device prescribed to correct the issue. This explains so much! Perhaps now I can get back to a regular cpap machine and finally find some rest. This is all a part of taking better care of me. This is what it's all about. As far as what I'm doing with food and exercise: I'm staying within a 1700 calorie budget. I've only walked a few times in the last week and a half. When I say "My food has been good," what I mean is, I've been within my budget and I haven't binged. I look forward to increasing my exercise and getting back some stamina. My goodness how quickly it goes! One mile and I'm hurting and out of breath!! I was doing 5 and 10 K's without too much difficulty--and now a mile is tough! But that's OKAY! :) Really--it is. And I know how quickly it returns with consistency. Given the circumstances, I'm proud of where I am. I'm back and it feels good. And I'm doing a fabulous job of being compassionate toward me... And considering I didn't really know what that meant at one point, I'm figuring it out and it's a much better way of being. I found some Joseph's 60 calorie pita's during my most recent shopping trip so needless to say it's been a regular feature of breakfast for me and even lunch as you'll see in the photo below. 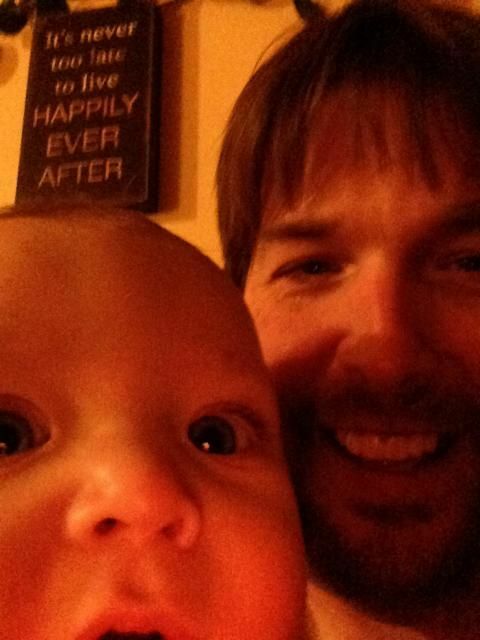 I've also included a picture of Noah and me playing with the camera phone. Noah is my 6 month old grandson! I'm a 42 year old gramps, can you believe it? 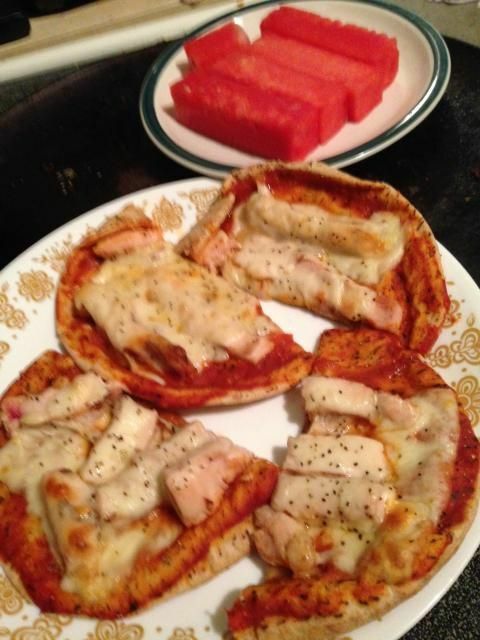 Recent lunch: Chicken and Cheese Pita Pizzas with a side of watermelon! It was a little too much actually, checking in at 574 calories. I was full 3/4 of the way. The highlight of 2013, for sure: My grandson Noah Riley was born July 6th, 2013 to my daughter Courtney. In this photo, Noah is constantly fascinated by the phone. He really wants to drool all over my phone! Total accident that the inspirational message on the wall behind was "photo bombing" us. It reads: "It's never too late to live happily ever after." Very nice. What is "the click?" What happens? How does it happen? I don't know, really, but from my experience and from witnessing the experiences of others, I have an idea. How do we go from fantasizing about food, sneaking to get food, hiding the consumption, feeling constantly obsessed about food and existing in a fog of self-deception, lies, guilt, shame and more to all of sudden feeling empowered, strong, supported and on track with it all? How is it that I can go into the store last night and shop for groceries without one single errant/diseased thought, when a couple of weeks ago I was in a store, sneaking around with shifty eyes, very much like a thief, hoping and praying I wouldn't be noticed buying a carton of ice cream, chips and sour cream french onion dip? I believe it starts with honesty. At some point, we might find a break, a clearing from the obsession, long enough to have a very serious realization that this isn't getting better in the middle of this pattern of self-destruction. Breaking down and admitting I'm powerless and I need help isn't so easy, especially for someone like me who has had success, lost a bunch of weight and loves to tell himself how strong he knows he's capable of being. Only a fool believes he can do this alone. And I've had several foolish thoughts along the way. Pride stands in the way like a locked prison door. If I admit I'm powerless over this, then I'm done. It's over. It might as well kill me now, because that's too hard to admit. It must be acknowledged and I must have faith that it's not over at all, in fact, it's a new wonderful beginning. There's no such thing as moving forward without this crucial realization. This isn't anything new to the countless who have found recovery. They recognize it as the first step. So I got there again, this point of truth where it all comes seemingly at once; truth knocking harder and harder with increased volume: The scale at the doctor registering 373, a 143 pound gain, the insanely high blood pressure reading, the size 50's no longer comfortable for long periods of wear and suddenly all of these real consequences and more, barge their way into one desperate thought: I'm dying here. Not instantly dying, but that's where it's headed. I don't want to die, please God, don't let me die, please help me!! I have too much to live for! Not now, I'll do whatever it takes. Sitting in the vehicle after the appointment and having the calmest of realizations, I didn't have an ounce of self-deception left in my brain. I've said this prayer before. I've written about this before. So what's going to make this time different? Again, what's "the click?" "The click," in my opinion, is a combination of several things and it only takes hold if it's firmly backed by supportive actions. I had to come out of hiding and fully acknowledge where I am. I must continue seeking support from others and not ever take support for granted or discount its power. I must exercise my spirituality and then do it again. I must write and share and never declare, "there ain't no going back," because I know: At any point in time, if I decide "I'm good, seriously, it's all good," and I start slipping into the old traps and I suddenly adopt some kind of false sense of immunity to the fall, that's precisely when it will come tumbling down once again. I walk cautiously with the"click." I'm writing more, sharing more and asking for support more. I'm doing my best to be supportive of others too. We are all in this together. The "click" isn't simply a choice. To me, the "click" is a place, a foundation where each choice after supports and strengthens the "click," or contrary; tears it down and chalks it up as another false start. The choices are in front of you and me. I'm choosing change because change is a comin' one way or another and I really desire positive change. Maybe the question isn't "What is the click?" Maybe the proper question is "Where is the click?" It's inside you and me. We have it. In the depths of the fall we're blind to its existence. Don't believe it doesn't exist, do not give up hope. I swear it didn't exist a short while ago, but it did. I just couldn't find it through the fog. Perhaps what's desired shouldn't be the click itself, rather, the clearing where it can once again be found. I sincerely appreciate your support on this blog, on Facebook, www.facebook.com/seananderson505 and via Twitter, @SeanAAnderson and via MyFitnessPal: SeanAanderson. First of all, I've been given an incredible amount of support through the comments on my last post, Facebook, email, personal visits and phone calls. Thank you very much. I've been very hard on myself over this situation and I was entertaining irrational fears about the response my post might bring. But like most fears, it was mostly a product of my imagination, influenced by how I feel about me and where I am. I should have known my friends and supporters wouldn't treat me the way I sometimes treat me. I'm taking small steps each and every day. I haven't had any major struggles with food since hitting the "publish" button Saturday afternoon and that's a powerful thing. I did have a minor episode at the grocery store this afternoon. I was going in to pick up something to cook for dinner. Immediately I started having ridiculous food cravings in the middle of the store. The signals and thoughts were coming and they were distracting me from the task at hand. I still had an empty cart after walking around the store for ten minutes. I couldn't decide what to buy and the errant thoughts were jumping up and down like excited kids spotting an ice cream truck. I know what to do, I followed the advice of a good friend of mine (who has twenty years of maintaining a 100 pound loss) and sent her a text, "Could you remind me how important it is for me to be strong late afternoon, please? Having cravings and ridiculous thoughts...First time since Saturday." I told on it. And then waited for a reply. I stood there with chips on one side and the ice cream freezers on the other, not moving, just staring at my phone. I had no idea that my friend was actually visiting the happiest place on earth at that moment, but yes, even in the middle of Disneyland she took the time to reply with four words: "Be strong for you!" And then, "write about it." I'm not so sure if my strategy was me being strong or not, but I quickly headed for the door...without groceries, leaving my empty cart in the aisle. I decided to have soup for dinner. I even completed two full days of logging my food on My Fitness Pal. I made the right decisions in those moments. And that makes me feel good. It's very easy to say "I'm letting go of the guilt and shame I feel over this weight gain." But it isn't so easy. I couldn't bring myself to come out and actually say how much I've gained in my last post. Only one person pressed the issue on facebook and my relenting wasn't as much to do with giving in as it was the product of some careful thought and consideration yesterday morning. Why didn't I just admit the number in the first place? I would have been correct in saying that I have every right to share or not share certain things, I mean really, we all must work within the boundaries we're most comfortable. But since when did I start withholding numbers?? That question was precisely the point made by Tammy on Facebook. When I was losing weight, I never kept the numbers secret. Even when I hit a stall along the way, the numbers had always been there since the first 505 pound weigh day. So what kept me from sharing the number on Saturday? Guilt and shame, pure and simple. So I couldn't honestly say "I'm letting go of the guilt and shame..." unless I let go of the number 143. Yes, I gained back 143 pounds. It's amazing how quickly I felt relief when I shared the number on Facebook Tuesday. I sincerely appreciate the many friends who quickly defended my right to keep that information between my doctor and me, and you were right. But honestly, I needed to let it go. I needed to say it. And I did. And my world didn't fall in on me. In fact, I received a tremendous outpouring of love and relation. I literally wiped tears away as I read a few of the personal stories emailed to me from people who had been here, right here where I am. And the most comforting feeling swept over me. I'm not alone. We're all in this together. I'm looking forward to weigh day again. I haven't been able to honestly say that for some time. And I look forward to sharing the numbers and the experiences along the way. I'll share the ups and downs, the successes and most importantly, the struggles. If you shared your story with me recently, please know, you touched me and I sincerely appreciate you. I recently watched a Ted Talk suggested in a comment on my last post. It was presented by Neuroscientist Sandra Aamodt, entitled "Why Dieting Usually Doesn't Work." It explained many fascinating things in twelve minutes. She talks about our body weight "set point." It was especially fascinating to me because somewhere early in this blog, I remember writing about my suspicions of some kind of set point or limit, based on the fact that I had lived completely out of control with food for many years and still, my body stayed within ten pounds of 500. My reaction to this Ted Talk wasn't negative at all. It simply reaffirms that for people like us, maintaining a healthy body weight means maintaining a balanced lifestyle with food and exercise forever, in effect, rebelling against our brain's best efforts to return us to an excessive "set point." Again, the bottom line is something most of us realized a long time ago, only I hadn't heard it explained by a neuroscientist. Thank you New Me for suggesting I watch.